Like getting free books? Or, maybe you prefer being the one to spread the love by giving them away? 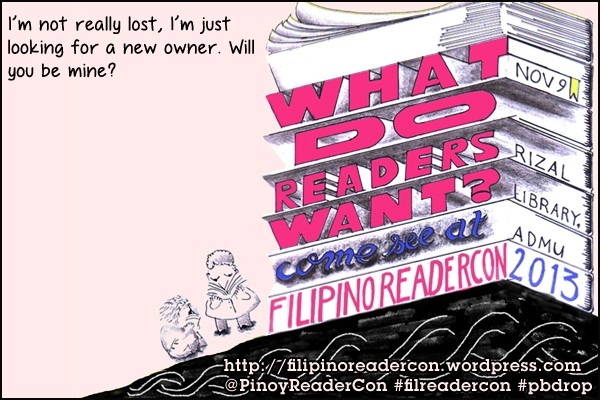 The Filipino Reader Con is holding an event that may tickle your fancy: The Pinoy Book Drop! 1. Pick a book (or two, or three, or yes, four!) that you wish to give away, or that’s okay for you to part with, for one reason or another. Make sure to check the pages for important stuff – anything you may have inserted there and forgotten but you may want to hold on to. 2. Download and print the customized bookplates that you’ll find below these instructions. It doesn’t have to be in color – black and white will work just as fine! Paste or stick one bookplate on a clear page or area of the book/s that you wish to give away. Yes, you can sign your name there, too, if you want. 3. Leave or “drop” the book/s in a public place, or basically any place where people are sure to see them: in a café, in the office, at a restaurant, the gym, it’s up to you. (Well, maybe not inside a bookstore, yeah.) You know where someone is likely to see the book/s and pick it up, yes? 4. Before leaving the book/s where you “dropped” them, take a photo. If you’re leaving two or more books, be sure to take note of the date, time, and place where you left each one. (a) If you have a Twitter account, just tweet the title of the book, where and when you dropped it, and attach the appropriate photo. If you dropped two or more books, tweet about each title separately. (b) You can also post about it on Facebook – on your own profile/timeline, if it’s set to public, OR on the Filipino ReaderCon page itself. Same details apply: title of the book, place and date of the drop, and photo. If you’re dropping two or more books, you have the option to include all the books in one go or post about the books individually. It’s up to you. IMPORTANT: Please use the hashtags #pbdrop and #filreadercon and don’t forget to tag us at @PinoyReaderCon for every tweet! 5. The actual dropping of books will take place for an entire week, from October 21 – 27, but if you have your book/s ready for dropping before then, that’s good too – just go ahead and drop them. We will post another set of instructions for this activity on the third Filipino Friday, October 25th. 6. On the other hand, if you’re one of those who are lucky enough to find a dropped book, we encourage you to tell us all about it, as well! 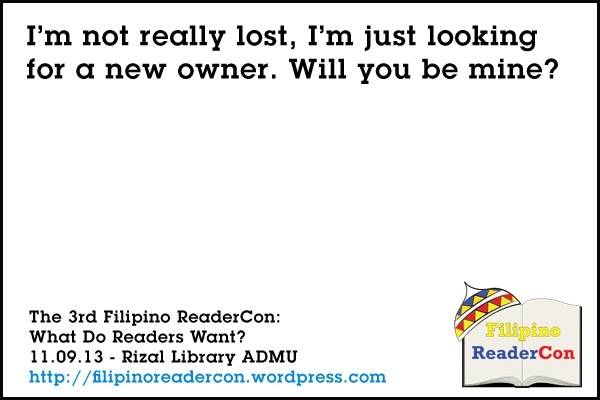 Tweet and Facebook any dropped book that you find – same instructions on using the hashtags #pbdrop and #filreadercon and tagging us at @PinoyReaderCon apply. Oh, and here are the Pinoy Book Drop bookplates courtesy of the lovely Tina. Additional Instructions: Interested to know who found your book? Just stick or attach a note addressed to your book’s new owner to Tweet or post on Facebook about his/her newest find. As usual, hashtags #pbdrop and #filreadercon and tagging @PinoyReaderCon are encouraged. Got it? Let’s do the Pinoy Book Drop! See you again on the third week of Filipino Fridays! I can’t stress enough how important it is that as many people as possible nominate (in Stage 1) and participate (during the voting in Stage 2). The Readers’ Choice Awards answers a dire need, because it’s the only annual Philippine literary award in which readers at-large can participate (that I know of — the Komikon Awards are not annual). One of the things I think that we local writers and publishers need to do better is connect with our readership and these awards are a great way for a wide bloc of readers to speak on a single stage (even while singing different tunes, so to speak), and the more people are on that stage, the better it will be at bridging that gap between writers, publishers, and readers. So do take the time to nominate and vote for the categories that you read. It’s important. It’s a fact that we don’t yet have the means to produce our own high technology, and won’t be capable of doing so for at least a generation more to come, if at all. This means that we’re completely at the mercy of whatever technology lands in our hands from first-world countries. Sure, they’re built and assembled in Asia, but the basic construction paradigms and even the basic marketing strategies stem from people who are of a different cultural milieu and world-view than ours. And yet, we’ve proven time and again that we are capable of adapting these technologies to suit our needs and to use them in ways that the original designers never even thought of. This happened a decade ago with SMS, and now with social media. But all of these are after the fact, merely reactionary to the arrival of foreign technologies. So that’s where speculative fiction —particularly SCIENCE fiction— comes into the picture: it’s a way for us to dream our own future, to empower us with a vision of what we can become. So that we’re more than just blind adopters of foreign technologies. Hi guys! On the chance that some of you may be interested in my non-specfic work as well, Choice of Games has just released Slammed!, my Interactive Fiction wrestling game, for iOS, Android, Kindle Fire, and, via the Chrome Web Store, Windows, OS X, and Linux. By “Interactive Fiction”, I mean something along the lines of a choose-your-own-adventure gamebook, with statistics, but without dice rolls. At 250,000 words, give or take, this is easily the longest story I’ve ever written, and you might say it’s my first novel (or first five novels). As I said, it’s not specfic — but really, pro wrestling is as close as you can come to a real life superhero universe. If you enjoy my writing, but don’t watch wrestling, I have it on good authority that you can still enjoy the game — you can try the demo to check the game out, or read the wrestling primer I prepared, for non-fans. In any event, this is a labor of love that I devoted more than half a year of my life to, and I’d love it if Rocket Kapre readers would give it a try, and help me spread the word. We’re proud to announce that SLAMMED!, the latest in our popular “Choice of Games” line of multiple-choice interactive-fiction games, is now available for iOS, Android, Kindle Fire, and, via the Chrome Web Store, Windows, OS X, and Linux. Slammed! is an epic interactive professional-wrestling novel by Paolo Chikiamco, where your choices determine how the story proceeds. The game is entirely text-based–without graphics or sound effects–but driven by the vast, unstoppable power of your imagination. Enjoy a 250,000-word personal tale of friendship, competition, and revenge. Develop not only your physical abilities, but a favored wrestling style. Become a heroic face, or a villainous heel–or even turn heel. Turn a scripted match into a real fight–and vice versa. Decide when to keep kayfabe, and when to break it. We hope you enjoy playing SLAMMED!. We encourage you to tell your friends about it, and recommend the game on StumbleUpon, Facebook, Twitter, and other sites. Don’t forget: our initial download rate determines our ranking on the App Store. Basically, the more times you download in the first week, the better our games will rank.